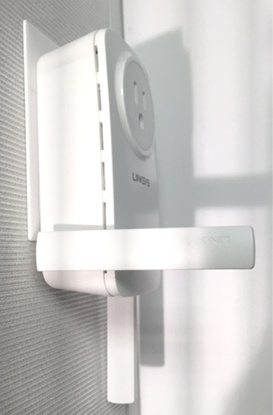 The Linksys RE6700, RE6300 and RE6400 have two (2) non-detachable antennas each, that enable them to provide maximum coverage, especially to multi-story homes. Below are suggestions on how to properly position your range extender. NOTE: In the examples below, the Linksys RE6700 is used. For Single story – both antennas should be pointing down. 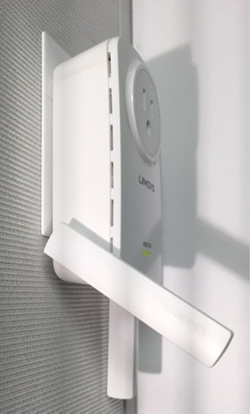 For Multi-story – One (1) antenna should be always down, while the second antenna should be positioned differently depending on where the extender is located and where the wireless coverage is needed. For the most part, position one (1) antenna at 45 degrees, as shown in Picture A. If there are issues with coverage, move the antenna about 50-55 degrees down, as shown in Picture B. If this still doesn’t give the wireless coverage that you need, continue adjusting one (1) antenna up or down and continue to check the signal strength or coverage in the specific area that needs coverage. IMPORTANT: Antennas are fixed and can ONLY rotate at 180 degrees. Do NOT force the antennas too far back, otherwise, they can break. Picture A. This antenna positioning can be used if the extender is in the middle of the house. Picture B. 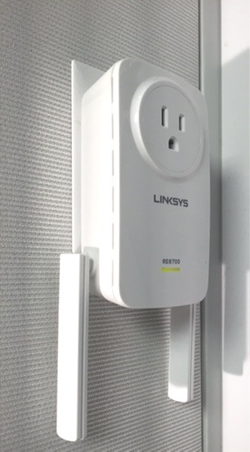 This can be used if the extender is connected to an outlet that is on the far side of the house.